First Annual General Meeting and Inaugural Lecture (17/2/95). Seminar on Male Urinary Incontinence Care by the Hong Kong Continence Society (1/9/95). 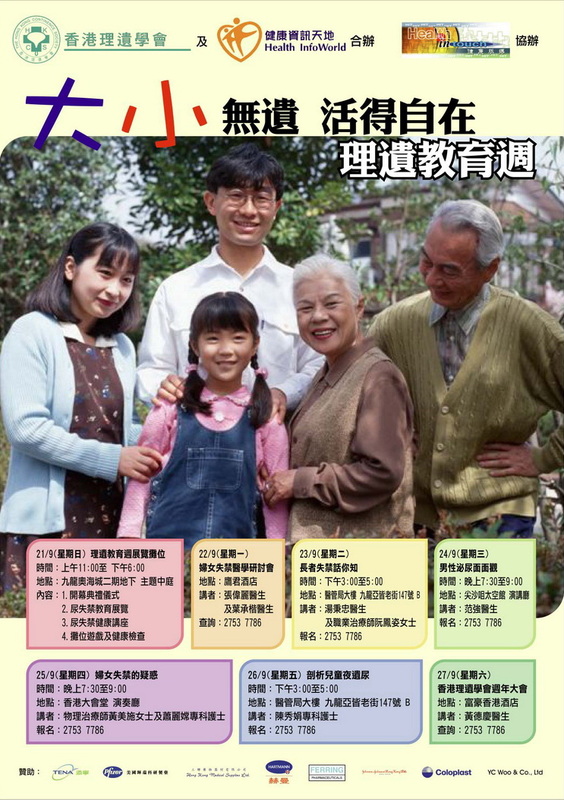 Workshop on Continence Care by the Hong Kong Continence Society (27/10/95). 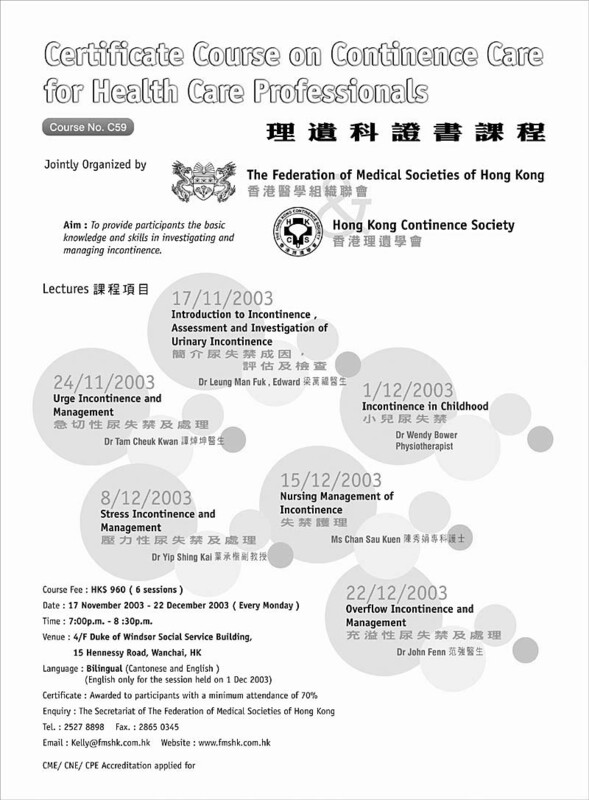 Seminar on Continence Care by the Hong Kong Continence Society (16/11/95). 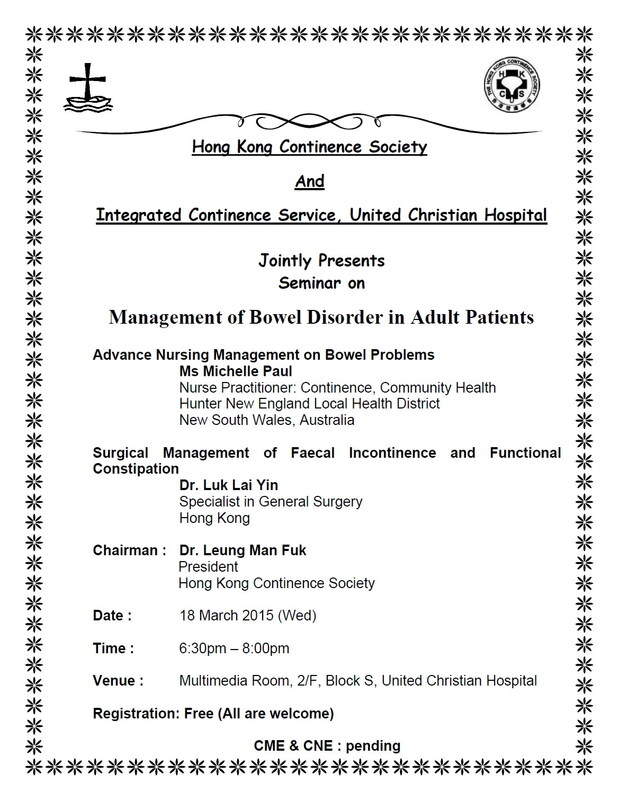 Seminar on Continence Care by Hong Kong Continence Society & Queen Elizabeth Hospital (5/3/96). Joint seminar on Urinary Incontinence and Benign Prostatic Hyperplasia by the Hong Kong Continence Society and Hong Kong College of General Practitioners (30/5/96). Annual Scientific Meeting and Annual General Meeting of the Hong Kong Continence Society (25/6/96). 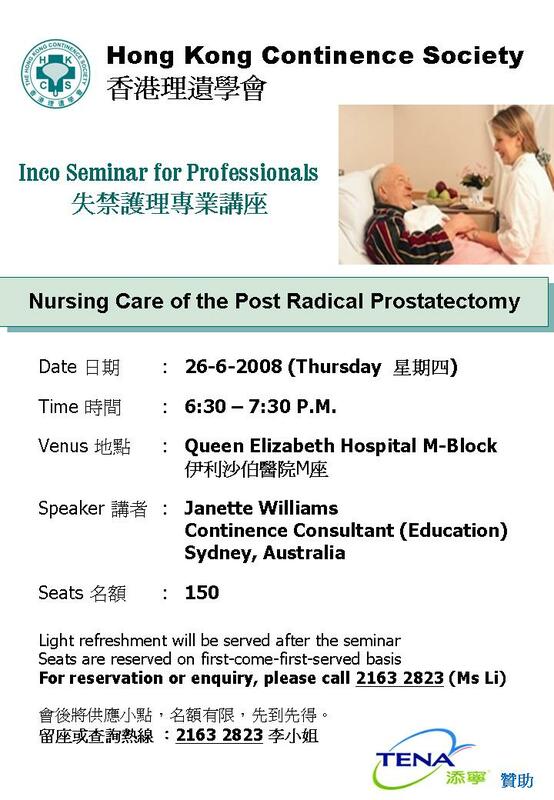 Certificate Course on Continence Care for Registered Nurses by the Hong Kong Continence Society (July 96). Seminar on Management of Urinary Incontinence by the Hong Kong Continence Society (28/11/96). 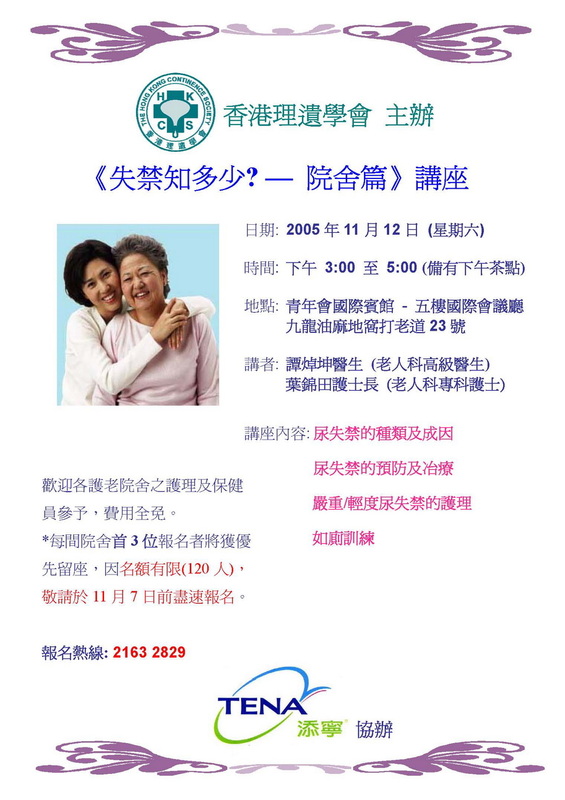 Public Health Talk - Urinary Incontinence by the Hong Kong Continence Society and Community Rehabilitation Network (26/4/97). Seminar on Management of Urinary Incontinence by the Hong Kong Continence Society (24/6/97). Annual Scientific Meeting and Annual General Meeting of the Hong Kong Continence Society. Certificate Course on Continence Care for Health Care Professionals by the United Christian Hospital and Royal Prince Alfred Hospital, Australia (27/10/97-8/11/97). 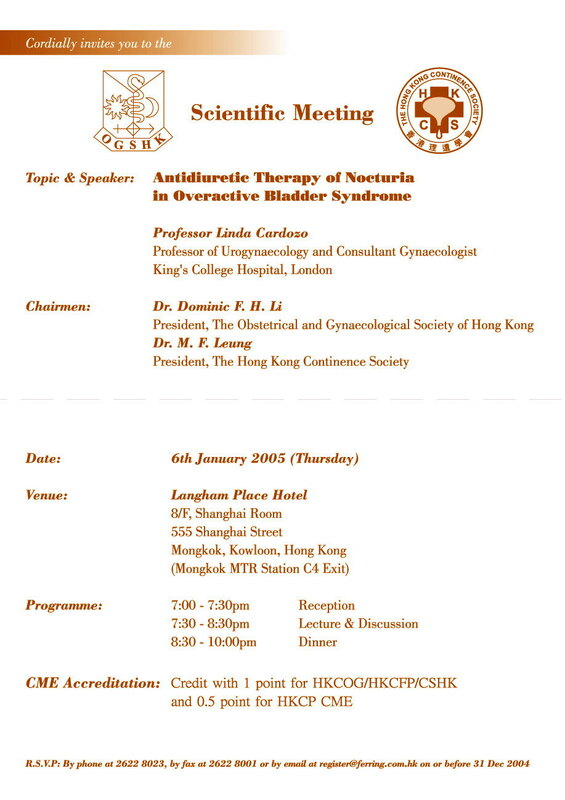 Seminar on Incontinence by the Hong Kong Continence Society and the Obstetrics & Gynaecological Society of Hong Kong (11/3/98). 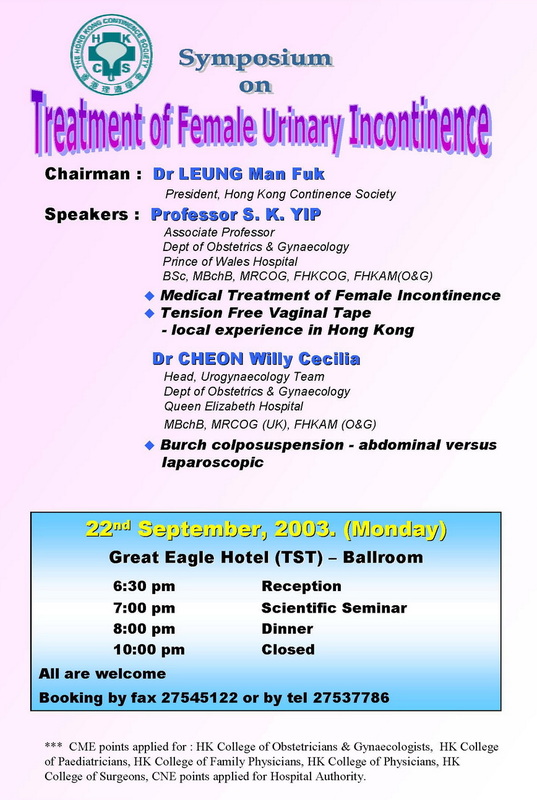 Annual Scientific Meeting and Annual General Meeting of the Hong Kong Continence Society (26/9/98). Investigation and Management for Urinary Incontinence by the Hong Kong Continence Society and Hong Kong Physiotherapy Association (9/1/99). Scientific Meeting on Management of Overactive Bladder by the Hong Kong Continence Society and the Obstetrics & Gynaecological Society of Hong Kong and Hong Kong Urological Association (22/7/99). 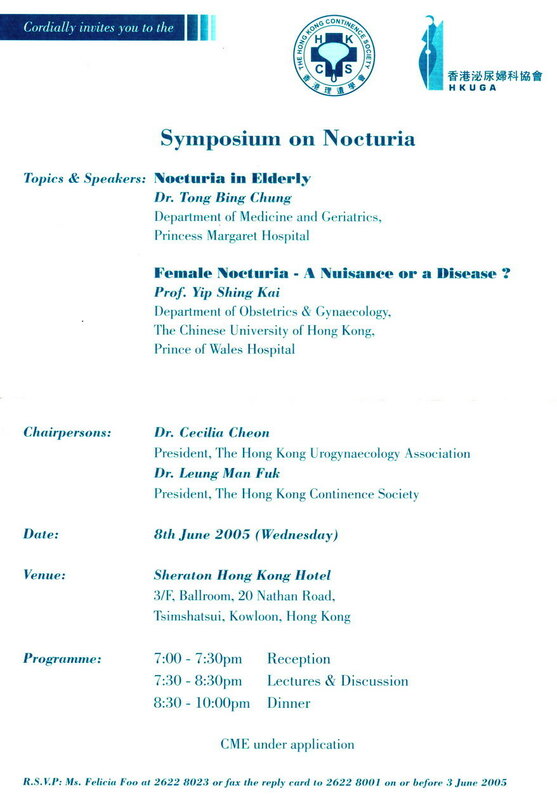 Continence Care Seminar by the Hong Kong Continence Society and Alice Ho Miu Ling Nethersole Hospital (24/8/99). 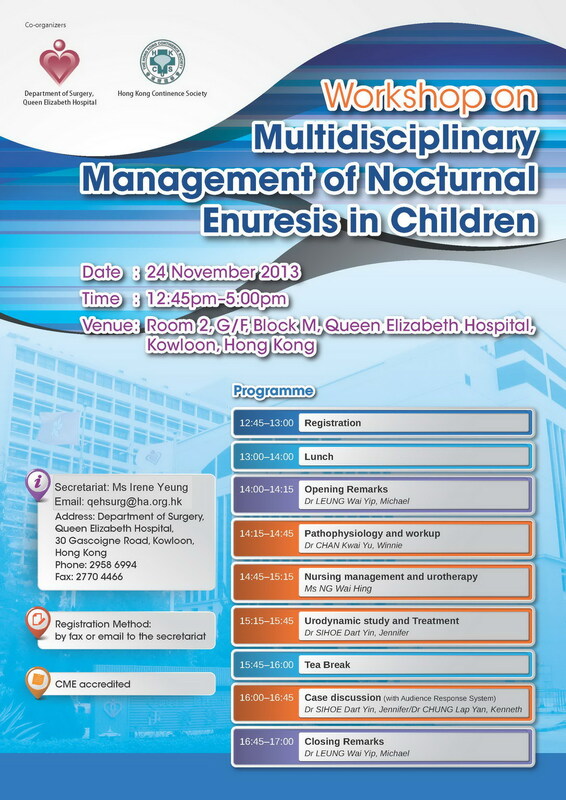 Hong Kong Urodynamic Workshop by the Hong Kong Continence Society (12-13/11/99). Short Course in Continence Care by the Hong Kong Continence Society (15-16/11/99). Second Scientific Meeting of the Asian Society For Female Urology by the Hong Kong Continence Society and Hong Kong Urological Association and the Hong Kong College of Obstetrics and Gynaecologists (24-25/8/00). Training Course on Advanced Continence Care by the Hong Kong Continence Society (26/8/00). Certificate Course in Continence Care by the Hong Kong Continence Society (18/5, 1/6, 6/7, 20/7/02).